TEGUCIGALPA, Nov 28 2016 (IPS) - It was in the wee hours of the morning on October 19 when journalist Ricardo Matute, from Corporación Televicentro’s morning newscast, was out on the beat in San Pedro Sula, one of the most violent cities in Honduras. He heard about a vehicle that had rolled and was the first on the scene of the accident. When he saw four men in the car, he called the emergency number, for help. Little did he know that they were members of a powerful “mara” or gang. Furious that he was making the phone call, they shot and wounded him, and forced him to get back into the TV station’s van, along with the cameraman and driver, and drove off with them. But other journalists who also patrol the city streets each night saw the kidnapping and chased the van until the gang members crashed it and fled. If they hadn’t been “rescued” this way, the three men would very likely have been killed, because the criminals had already identified Matute and they generally do not leave loose ends, the journalists involved in the incident told IPS. Matute, who is part of TV5´s so-called Night Patrol, was wounded in the neck with an Ak-47. The reporters lamented that in spite of the fact that the accident occurred near military installations and that they asked for help, the military failed to respond. “The state does not protect us, but rather attacks us,” one journalist told IPS on condition of anonymity. Now Matute, a young reporter who was working for Televicentro, the biggest broadcasting corporation in Honduras, is safeguarded by a government protection programme, under a new law for the protection of human rights activists, journalists, social communicators and justice system employees. Some 10 journalists, according to official figures, have benefited from the so-called Protection Law, in force for less than a year. Matute sought protection under the programme after the authorities released, a day after the accident, a video showing the gang members who attacked him, captured by a local security camera. They were members of Mara 18 and carried AK-47 and AR-15 rifles. Mara 18 and MS-13 are the largest gangs in Honduras. Mara 18 is the most violent of the two. Through turf wars they have basically divvied up large towns and cities for their contract killing operations, drug dealing, kidnappings, money laundering and extortions, among other criminal activity. The authorities recommended that Matute take refuge under the protection programme and leave his job, since after the video was broadcast, the gang members felt exposed and could act against him in retaliation. The young reporter Mai Ling Coto, who patrolled with Matute in search of night-time news scoops, told IPS that reporting in Honduras is no longer a “normal” job but is now a dangerous occupation. This is especially true in a belt that includes at least eight of the country’s 18 departments or provinces, according to the Violence Observatory of the Public National Autonomous University of Honduras. “Now the only thing that is left is to entrust ourselves to God. We used to report normally without a problem, but now things have changed, especially for those of us who work at night. We have to learn new codes to move around danger zones in the city and the outskirts,” she said. “If we go to gang territory, we have to roll down our windows and flash our headlights; we move around in groups so they see that we are not alone,“ said Coto from San Pedro Sula, describing some of the security protocols they follow. San Pedro Sula, 250 kilometres from the capital, is the city with the most developed economy in Honduras. It has a population of 742,000, and in 2015 had a homicide rate of 110 per 100,000 people. This Central American nation of 8.8 million people is considered one of the most violent countries in the world. 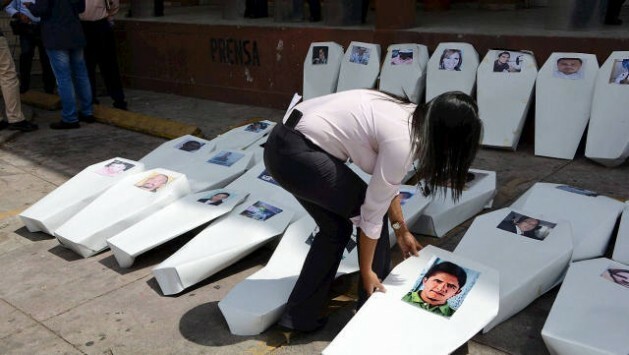 The Commission for Free Expression (C-Libre), a coalition of journalists and humanitarian organisations, reported that between 2001 and 2015 63 journalists, rural communicators and social communicators were murdered. In 2015 alone, C-libre identified 11 murders of people working in the media: the owner of a media outlet, a director of a news programme, four camerapersons, a control operator, three entertainment broadcasters, and one announcer of a religious programme. 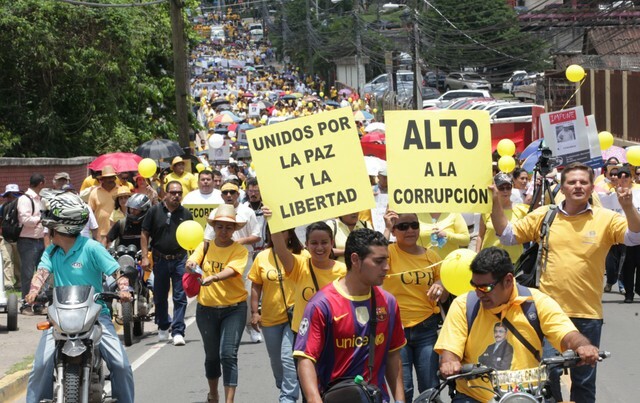 Most of them occurred outside of Tegucigalpa. Ana Ortega, director of C-Libre, believes that journalism is not only a victim of violence, but also of laws and impunity. She stated this in the group’s annual report on freedom of expression, observing that a secrecy law obstructs the right of information, while new reforms to the criminal code are planned with references to the press. “Now it turns out that reporters not only have to avoid commenting or giving news that affects the country’s power groups, but also common criminals, and meanwhile the authorities don’t give us any real assurance of protection,” Juan Carlos Sierra, director of the news broadcast where Matute worked, told IPS in Tegucigalpa. “We feel like neither the state nor the authorities respect us,” he said. Of the 63 documented murders, legal proceedings began in just four cases, and of these, only two made it to the last stage – an oral public trial – and ended with the conviction of the direct perpetrators, but not of the masterminds who ordered the murders. “Investigation in Honduras is a failure, everything is left in prima facie evidence, and not only the press is trapped here by violence, but also human rights activists and lawyers,” Velázquez told IPS. According to reports by human rights groups, corruption and organised crime are the main threats to freedom of speech in Honduras, where being a journalist has become a high-risk occupation over the last decade.